Our Pink Twinkle Twinkle Little Star baby shower or birthday party placemats truly do put the finishing touches to your girl party decorations. At 12 inches high and 18.5 inches long, our place mats are the size of traditional table mats. Printed on a high quality paper, these place mats are disposable making clean up a breeze. They add the perfect amount of festive color to your table display without breaking the bank. 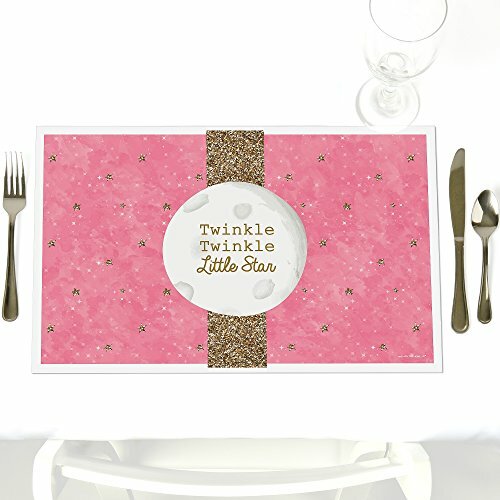 Pink Twinkle Twinkle Little Star party placemats INCLUDES 12 paper placemats. Pink Twinkle Twinkle Little Star baby shower or birthday party placemats are must-have party decoration that will look amazing on all your tables. Pink Twinkle Twinkle Little Star paper placemats SIZE 18" wide x 12" high. This exclusive design is a stunning way to decorate for a star and moon baby shower or birthday party. Plus, these disposable party placemats will make it easy to clean up after the event is over. EASY TABLE DECOR: Bring your star and moon baby shower or birthday party theme to all areas of your celebration with cute party placemats. Pink Twinkle Twinkle Little Star placemats are perfect for dining tables, buffet tables and even gift tables or guest book areas. Pink and gold party table decorations will make a statement however you choose to use them. PREMIUM PARTY SUPPLIES: Pink Twinkle Twinkle Little Star placemats are professionally printed on heavy-duty cardstock paper with a photo-like shine. They are individually inspected and carefully packaged by hand. Party placemats will arrive rolled. Simply unroll to flatten, preferably as soon as they arrive. MADE IN THE USA: Pink Twinkle Twinkle Little Star - Party Table Decorations - Baby Shower or Birthday Party Placemats - Set of 12 are designed and manufactured at our Wisconsin facility using materials that are Made in America. Big Dot of Happiness GOAAAL! - Soccer - Petite Baby Shower or Birthday Party Paper Table Runner - 12" x 60"